There's more to effective and efficient working than rational thought . 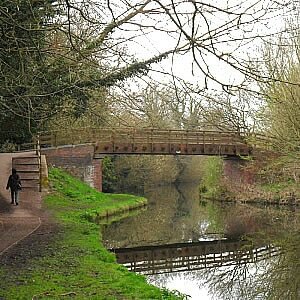 . .
why a bridge over an English canal? and the reflection of nature in what's best of human endeavours. Our role is to help you and your organisation Work with Wisdom. Wisdom comes from not-thinking: a very different skill to that usually taught for business. And, because every staff-member and customer is a thinking, feeling human-being we have to concern ourselves with not just objective facts, but with the subjective: how we feel . . .
What's really going on in your life and your organisation? How aware are you of the real issues? The Wisdom at Work team will help you tune-into your work-place: does it have a heart and soul? How do your stake-holders feel about how things are done? scientific understanding of life-on-earth and consciousness. Time and Tide wait for no man . . . Deep and sustained practice transforms people, improving well-being and inspiring cooperative working. However, with thousands of practices to choose from it can be challenging finding the right ones. As an enabler, part of the Working with Wisdom role is to signpost sources of dependable guidance and support. Contemplative Life has created a central hub that brings myriads of practices and communities under one umbrella and makes it easy for you to find practices of interest and connect with others of like mind. Visit our Working with Wisdom page on the Contemplative Life platform.